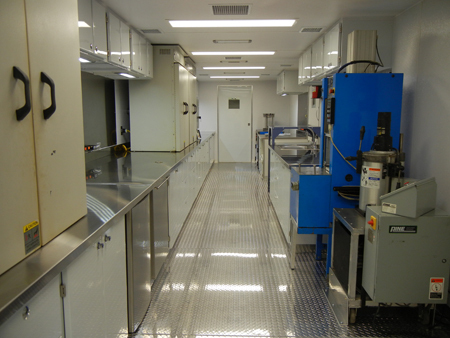 What can the Mobile Asphalt Testing Lab do for you? Equipped with state-of-the-art testing equipment, the Federal Highway Administration's (FHWA) advanced asphalt lab on wheels offers State transportation agencies both onsite project support and access to today's innovative and emerging technologies. At the request of a State and with agreement from the asphalt contractor, the lab can travel to a project site and conduct a range of tests over a 2- to 3-week period to evaluate an asphalt mixture. These tests are conducted parallel with the contractor's quality control testing during real-time mixture production. The lab's equipment includes the Asphalt Mixture Performance Tester, which measures the dynamic modulus, flow number, and fatigue properties of an asphalt mix, and the Aggregate Image Measurement System, which determines the shape, texture, and angularity of both fine and coarse aggregates. While the contractor's or State's test results are still used for contract compliance, the mobile lab's tests offer an additional set of data with which to validate results, helping to improve overall testing procedures and quality assurance practices. Following each project, lab staff summarize the test results and materials performance. A final project report containing detailed documentation, results, and recommendations is provided to the State transportation agency. The lab also offers assistance in validating equipment and using new materials and production techniques. Since FHWA launched the lab in 1993, it has been a vital resource in introducing States to such innovations as the Superpave mix design system, new asphalt binder modifiers, stone matrix asphalt, reclaimed asphalt pavement (RAP), warm mix asphalt (WMA), and reclaimed asphalt shingles, as well as new asphalt test specifications. These new test specifications include the Asphalt Mixture Performance Test and Multi Stress Creep and Recovery test protocols. "One of the Mobile Asphalt Testing Lab's greatest assets is its ability to introduce new technology into real-world construction," said Matthew Corrigan of FHWA. "Innovations continue to be implemented on site by the lab, including helping States combine asphalt technologies, such as using warm mix asphalt with reclaimed asphalt and shingles. While these combinations provide a challenge, the lab can help States successfully construct pavements that meet today's ever increasing demands." Recent field visits made by the lab have included assisting with WMA projects in Colorado, Indiana, Missouri, and Pennsylvania, and aiding in implementation of high-percentage RAP projects in Delaware, Kansas, Minnesota, New Hampshire, and Wisconsin. 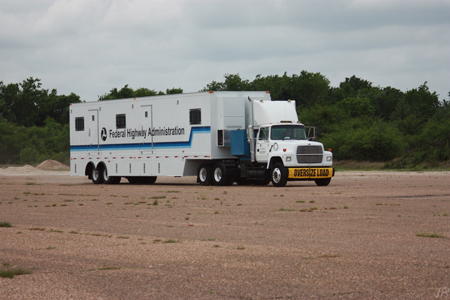 The lab has also provided assistance this year to researchers at the Texas Transportation Institute (TTI), conducting testing for National Cooperative Highway Research Program (NCHRP) projects 9-49 (Performance of WMA Technologies: Stage 1-Moisture Susceptibility) and 9-52 (Short-Term Laboratory Conditioning of Asphalt Mixtures). "The mobile lab allowed us to stretch our research dollars further, helping us obtain and collect samples and supporting the testing being done for the projects," said David Newcomb of TTI, principal investigator for NCHRP project 9-52. "The lab continues to be one of the most important tools in accelerating the implementation of good ideas. No other effort has come close in its ability to bridge research and practice." Upcoming projects for 2013 will focus on using crumb rubber modified asphalt mixtures and reclaimed asphalt shingle modified mixtures. 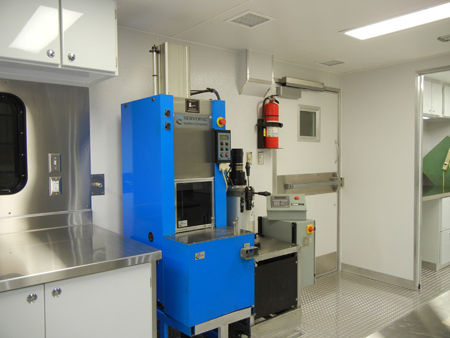 For more information on the Mobile Asphalt Testing Lab's services, contact your FHWA division office or Matthew Corrigan at FHWA, 202-366-1549 (email: matthew.corrigan@dot.gov). FHWA's Mobile Asphalt Testing Lab offers States onsite project support and access to innovative technologies. Testing equipment available in FHWA's Mobile Asphalt Lab includes gyratory compactors. The Mobile Asphalt Lab can conduct a range of tests to evaluate an asphalt mixture, including using the Asphalt Mixture Performance Tester to measure the dynamic modulus, flow number, and fatigue properties of a mix.